If you think a leak sensor is something your home should have, here are our top picks. If you want more information on this topic and want to read more reviews, scroll down a bit. Updated April 9, 2019 to add our take on the Sinopé Sedna water-leak protection kit. This system combines water sensors with an electronic valve that mounts on your main water supply, so it might react faster to a water leak than “smarter” valves—such as the Flo by Moen—that rely on algorithms analyzing water pressure and flow rates. On the other hand, if a pipe bursts far from one of Sinopé’s sensors, your home could suffer a lot of water damage before any of those sensors trigger the valve to shut off the water. Honeywell's Lyric Water Leak and Free Detector alerts you to three conditions that can cause problems in your home: water leaks, freezing temperatures, and high humidity. It's dead-simple to deploy, but its biggest drawback is that it can't be integrated into any smart-home systems. Although it’s the most expensive sensor we tested ($80), the Honeywell Lyric Wi-Fi Water Leak and Freeze detector is the most powerful and the easiest to set up. It operates over Wi-Fi and connects directly to your router without requiring a smart-home hub. And in addition to warning you about a water leak, the Lyric can also alert you to freezing temperatures and high humidity levels that can lead to other problems. The Honeywell Lyric Wi-Fi Water Leak and Freeze Detector is our current favorite in this category. The Lyric has one major shortcoming that could be a deal breaker for enthusiasts: It can’t be integrated into a broader smart-home system. So it can bring a water leak to your attention, but it can’t communicate with a smart water valve to shut the water off at the source. But Honeywell’s sensor can’t be beat on the basics. This was a tough call, because the Utilitech Water Leak Detector has some major downsides. Its battery life only lasts for a year, and the sensor must be mounted on a wall or other vertical surface, making setup a hassle and limiting your placement options. There are a few downsides to our next-best pick, but you can’t beat the price. 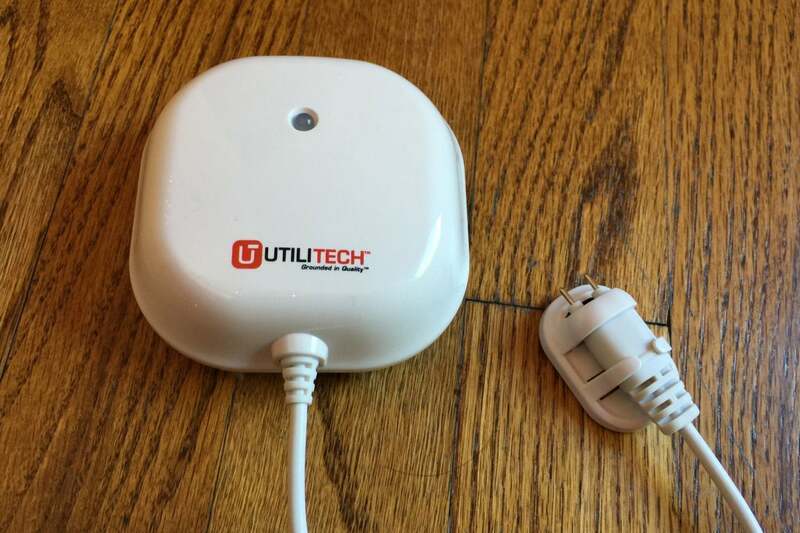 On the other hand, it costs just $30, it you can deploy them in multiples, and it works with most Z-Wave smart-home hubs (we tested it as part of an Iris by Lowe’s system; Utilitech is a Lowe’s brand). It's pricey, but the LeakSmart's ability to integrate into broader smart-home systems and its relatively inexpensive optional water shutoff valve help this leak detector stand out. 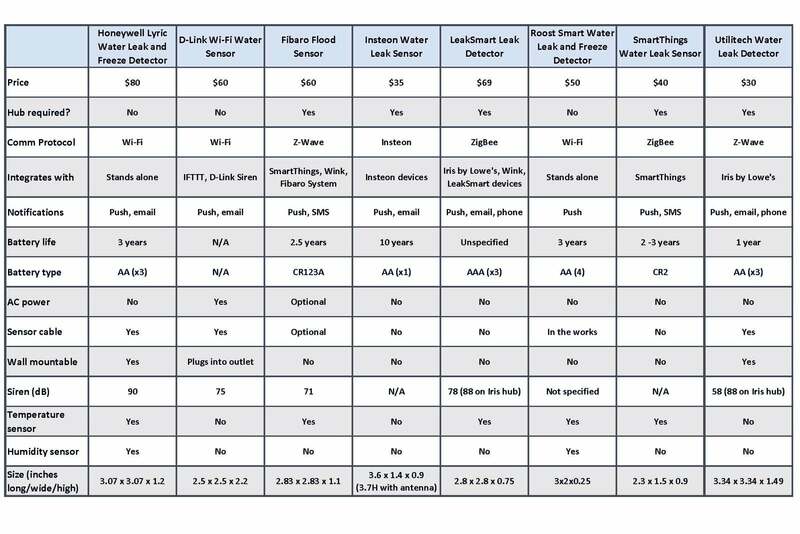 What sets LeakSmart’s hub-based sensor apart from others is that the company also manufactures a smart water shut-off valve ($159 at Lowe’s), which we did not test (most people would want to have that component professionally installed). Still, it’s a huge draw over other sensors that either require more elaborate valve setups or don’t offer those controls at all. You can pair the LeakSmart sensor with a smart shut-off valve from the same manufacturer. 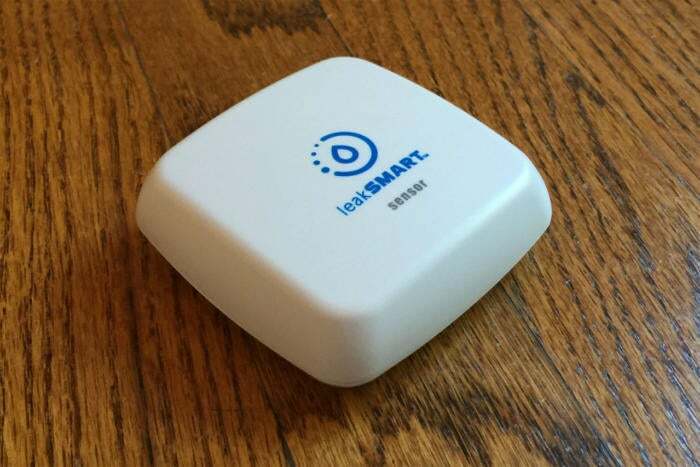 Aside from that perk, the LeakSmart Sensor works with both Wink and Iris by Lowe’s hubs (the latter also able to sound its own alarm, and it call you in case of emergency). This is also is one of a few options we tested that measures temperature as well as moisture. But at $69, it’s pricey for a sensor that requires a separate hub device. To measure each sensor’s effectiveness, we placed it on a bathroom tile, and then poured enough water to cover the surface of that tile. 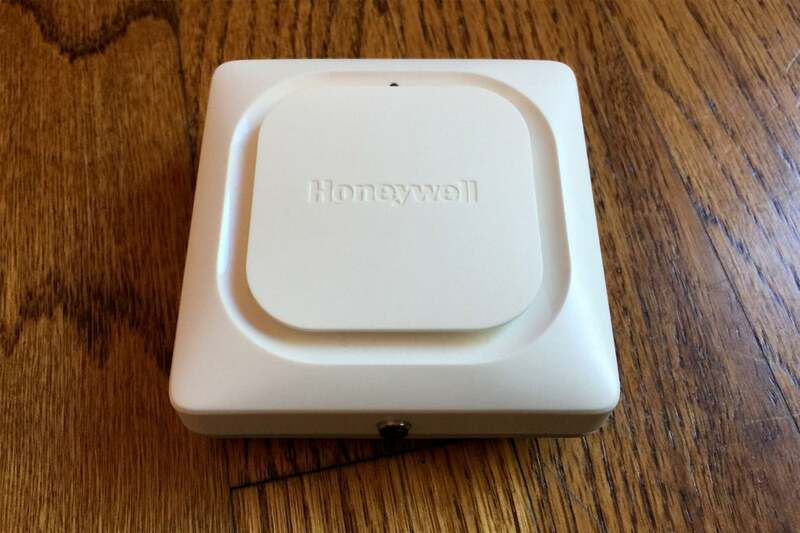 Most sensors responded immediately, though the Honeywell Lyric routinely delayed its alarm by around 30 seconds, which we noted in our full review. We measured alarm volume using the Decibel 10th app on an iPhone 6 Plus, with the microphone pointed toward the sensor from six inches away. Empirical testing aside, the Honeywell Lyric’s volume was subjectively much louder than the other sensors. We didn’t directly test integrations with other smart home devices, but inspected each companion app and the online service IFTTT for available features. We consulted manuals and product listings for battery life estimates and device dimensions. Editors’ note: This testing methodology does not apply to leak detection systems that monitor your water supply line, such as the Flo by Moen and the Sinopé Sedna. You might be surprised by the diverse approaches to what seems like a simple task: detecting the presence of water where it shouldn’t be. Some operate on Wi-Fi, others require a hub to communicate. Some plug into an AC outlet, others require a battery. Some come with external sensor cables and mount to the wall, others lay on the floor. Most, but not all, have onboard sirens. If the recommendations above don’t work for you, here are the specs and features you’ll want to consider when shopping for a smart home water leak detector. Hub requirements: Honeywell’s Lyric and D-Link’s sensor both operate on Wi-Fi, so you don’t need additional products to make them work. 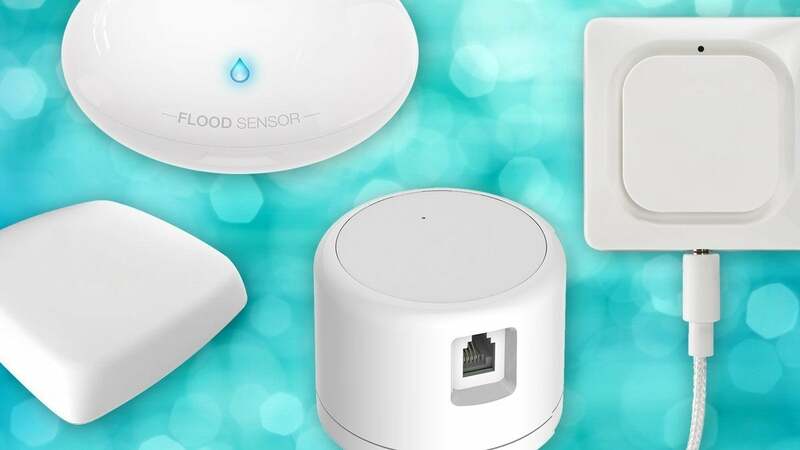 Other products, such as the Fibaro Flood Sensor and Insteon Water Leak Sensor, require a hub to connect to the internet and the apps on your phone. Hub-based sensors, such as this Fibaro Flood Sensor, can be integrated into broader smart-home systems. Connection protocols: If you own a hub already, you must make sure the sensor uses a compatible connection protocol. 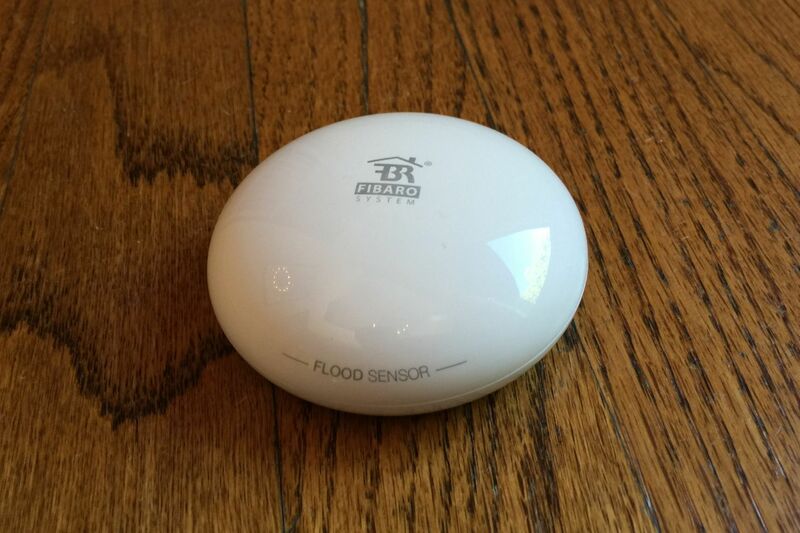 Fibaro, for instance, uses Z-Wave, which works with SmartThings and Wink hubs. Insteon sensors only work with Insteon hubs (one of which is compatible with Apple’s HomeKit technology). If you own a well-known hub such as Wink, SmartThings, or Iris by Lowe’s, you’ll likely see those names on the sensor’s box. Integrations: Some hubs, such as Wink, SmartThings, and Insteon, allow you automate actions on other devices when a leak occurs. That way, you can trigger lights, turn on cameras, or sound an alarm. (Iris by Lowe’s supports this as well, but only with a $10-per-month subscription.) Wink, SmartThings, and D-Link also support IFTTT, a service that lets you automate tasks between connected devices and services. Sensors that communicate with water valves can turn off your main water supply to stop a leak. Size and extendability: Where do you plan to put your leak sensor? If it’s a tight space, make sure the sensor is either small enough to fit, or that it offers a sensor cable to extend its reach. Built-in siren: Unless you plan to put the sensor far from where you might normally hear it, it’s helpful to have a siren onboard. That way, you’ll still get alerted at home even when the internet is down. Additional onboard sensors: Some leak sensors can also measure other environmental conditions that can lead to problems at their extremes, such as temperature (a frozen pipe can burst and cause catastrophic water damage) and humidity (excess moisture in the air can allow mold to grow). Power source: Most leak sensors are battery powered, but some, such as D-Link’s Wi-Fi Water Sensor, depend on AC power. An outlet-powered sensor with battery backup in the event of a blackout would be ideal; unfortunately, they are rare. Flo protects your home from water damage caused by both slow leaks and catastrophic failures, and it will also alert you to water waste. But it’s expensive and it won’t warn you about water collecting in places where it shouldn’t be. This water sensor's use of outlet power is both a curse and a blessing.